THOMAS A. ANGELO is founding director of the Academic Development Center at Boston College. He is coauthor (with K.P. Cross) of the 1988 edition of Classroom Assessment Techniques and editor of Classroom Research: Early Lessons from Success (1991) in the Jossey-Bass New Directions for Teaching and Learning series. K. PATRICIA CROSS is the Elizabeth and Edward Conner Professor of Higher Education in the Graduate School of Education at the University of California, Berkeley. She is the author of six other books, including Adults as Learners (Jossey-Bass, 1981). Getting Started in Classroom Assessment.Classroom AssessmentTechniques. Building on What We Have Learned. 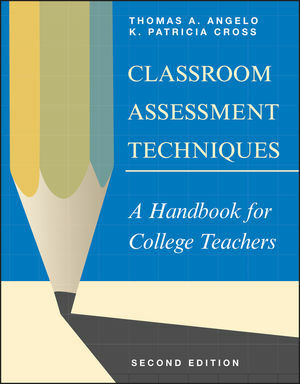 In the eleven years since the first edition of this book waspublished, Classroom Assessment has become increasingly useful inthe teacher's arsenal of tools. Once the concepts of CAT are understood, the instructor can moveon to create course-specific techniques tailored to his or herteaching style and the learning styles of a particular class, thusgreatly enhancing the usefulness of Classroom Assessment. This book is extremely useful and would be a worthy addition toboth teachers' and advisors' libraries.